New version adds powerful new features to unique hybrid production console. 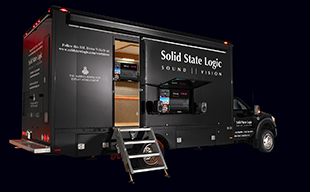 NEW YORK, NY — Solid State Logic, the world's leading manufacturer of creative tools for audio professionals, launches Matrix2 at the 2013 AES convention in NYC (Booth #2821). Since its 2008 launch the SSL Matrix console has established a high profile clientele who value its unique capabilities as a genuinely hybrid production platform. Its combination of SSL analogue summing, streamlined integration of boutique analogue outboard mic pre's & processing (via its software controlled analogue patch system) and advanced DAW control surface, provides production power and flexibility like no other console. This new version of the Matrix takes feedback from customers and provides a collection of powerful new features. One of the unique and much praised features of Matrix has always been the integrated software controlled patching of analogue channel inserts and this has been significantly upgraded in Matrix2. Hardware device inserts can now be loaded directly from the console hardware controls (previously this was done only via the remote browser software) with an intuitive new interface that facilitates loading individual processors, A/B comparison of different processors and building processor chains. The Matrix remote browser software has also been re-designed to provide a new ‘drag and drop’ style interface for loading processors and building chains. A powerful 'Fader Linking' system has been added to the console which allows two or more faders to be grouped, to facilitate stereo or 5.1 channel control or subgroup style mixing. The A-FADA (Analogue Fader Accesses DAW Automation) summing system used in Duality, AWS and the new SSL Sigma rack has been introduced to enable the analogue faders of Matrix2 to be driven by automation data from your DAW. A-FADA enables channel automation to be performed entirely in the analogue signal path but with the advantages of DAW automation data editing. The addition of A-FADA to Matrix2 facilitates project portability between different SSL products. The previously optional 5.1 output card will now be included as standard pre-fitted in all units. A collection of smaller new features have also been added including; 'partial TR setup save & import' which allows selected parts of the console setup to be saved and imported as setup templates, new Preset insert matrix 'scenes', Preset insert naming tools, "automatic dB readout" for Pro Tools users (allowing the scribble strip to automatically display fader values upon touch), modifier key 'press and hold' functionality for Cubase/Nuendo users and new DAW templates for Presonus Studio One and Ableton Live! Matrix2 will ship in Dec 2013. All of these new features (excluding the 5.1 output card) will be available to existing customers as a free upgrade.